The Hitch tightener is a proven solution to prevent hitch movement - whether it be for a bike rack, cargo rack, spare tire mount, trailer or pretty much anything else you're towing are carrying in your hitch. Our anti-wobble kit fits 2" and 1.25" hitches and effectively prevents rattling, wobbling, rocking, and movement behind your vehicle caused by a common hitch connection. The stainless steel U-bolt and heavy-duty powder coated tightening plate are specifically designed to endure weather, heavy loads. If you're looking for a product that is easy to install and will prevent hitch noise and wobble, the Gekers hitch tightener is a guaranteed quiet ride. Simply slide the sturdy U-bolt over the hitch bar, install the anti-rattle tightening plate and listen to that sweet sound of silence! It's as easy as that. 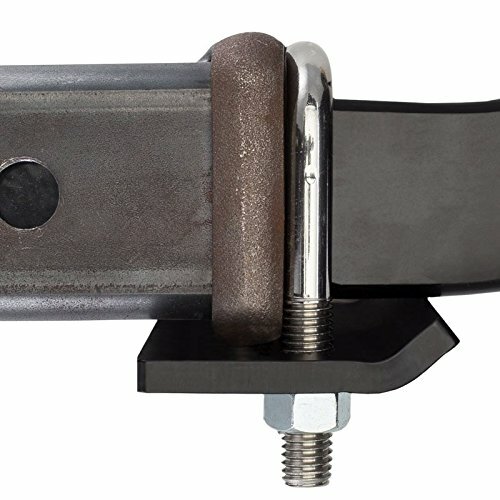 Hitch tightener is compatible with all hitch brands, including Curt, Blue Ox, Hidden Hitch and U-Haul, among others, and hitch classes I, II, III, and IV (1, 2, 3 and 4), both 2" and 1.25" models, ideal for hitches on SUV's, vans, trucks, RV's, sedans and trailers. If you have any questions about this product by Gekers, contact us by completing and submitting the form below. If you are looking for a specif part number, please include it with your message.